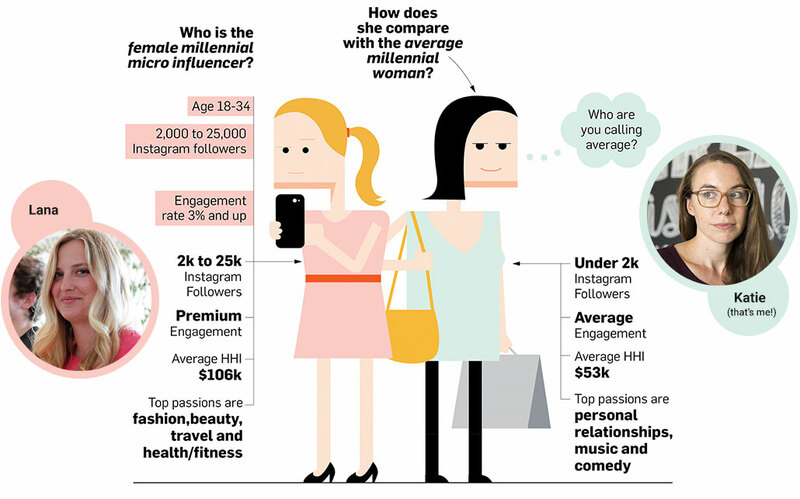 This all started because I saw an infographic on AdWeek – comparing the “average” millennial woman with the “average” female millennial micro influencer. And looking at that illustrated comparison, I couldn’t help think, my goodness, that looks just like Lana and me. As her follower on Instagram, I already knew some things about Lana’s approach to social media posting: an aversion to hashtags, for example, and an appreciation for tiny dogs in smart outfits. But what I didn’t realize, prior to interviewing her, was the deep well of marketing insights constantly simmering in her micro-influencer mind. Awesome. So, are you a female between the ages of 18 and 34? Would you name fashion, beauty, travel and health/fitness among your top interests? Do brands pay you for your Instagram posts? Well, there’s no doubt about it — you’re indeed one of those female millennial micro-influencers we’ve heard so much about. How did you get into the business? Basically how it started is that I was really obsessed with this one jacket that I saw on social media. It was this camo print with Queen written on it in huge orange letters, it was incredible. I started to follow the clothing brand that’d produced it, trying to watch for when they’d have a sale, and eventually they did and I swooped in and grabbed the jacket for 30% off or whatever. Once I did, I got an email from the brand saying they were looking for influencers, would I be interested, etc. Since I loved the clothes, I applied to be an influencer, and I was accepted! Don't need a 👑 to remind me I'm a queen. 📷: my ride or die @noramullen PS score this dope jacket from @millioneiress before it sells out. Again. With that brand, I never got paid, but I got free swag and a discount. Since I was already actively trolling their IG feed for flash sales and whatnot, this was perfect for me. I’d get free stuff or discounts, and then I’d post photos of me wearing the clothes, or using the merchandise. It was win-win for me since I’d do that anyway, I was already such a huge fan of the brand. What content categories have you created posts for? Local restaurants, beauty, fashion, and retail-focused apps have been the major contenders so far. I probably post one to three times a month and I’m really careful about what items I will choose to do, because I am building a brand for myself and I don’t want to post about something that doesn’t work seamlessly within that brand. Since I have a smaller-sized audience as a micro-influencer, most of the people following me either know me or have gotten to know me pretty well through my posts. I don’t want introduce something that’s going to confuse them about who I am or what I’m about. So what’s something that you would choose NOT to post about, for example? Well, just to give you a concrete example — and this is kind of a funny one — I recently got an offer from this bidet company. They’d install a bidet in my bathroom and then I’d post about it on Instagram… it was interesting but in the end wasn’t something I really felt comfortable putting out there on my feed. How are you compensated for posts as a micro-influencer? Sometimes it’s as simple as a transfer into your PayPal account — you write the post and you’re paid. Other times, you’re given a unique referral code to put into your Instagram bio, and you’re compensated in relation to how many clicks it gets. In other cases, you’re compensated with discounts or free merchandise in lieu of payment. So I think the trick is to identify how you want to be paid, and seek out those opportunities. How can you increase your likelihood of getting the types of opportunities you want? There are a bunch of ways you can become more attractive to brands as a micro-influencer. Your stats matter a lot. The number of your followers, your engagement rate…overall, the better your stats are, the easier it is to either get approached by a brand, or accepted by a higher end influencer network like RewardStyle. I’m on a mission actually to double my followers by the end of the year. Right now my engagement rate is at about 3.9%, which is pretty good, but it’s something I’m always working at. The fact that micro-influencers tend to have higher engagement rates isn’t an accident. We work at it, every day. I almost always like, or comment back, to every comment I receive on my feed. I make a concerted effort to make my followers feel included in the conversation. It’s part of what I offer as a micro-influencer. Instagram users with 1K to 10K followers had a 4% engagement rate, while those with one million to ten million followers had only a 1.7% engagement rate on average (Source: Hubspot). Micro-influencers are also significantly more affordable than larger-audience influencers — 97% of them charge $500 or less per promotion. You mentioned the RewardStyle influencer network as an aspirational goal. Do you currently belong to an influencer network? Yes! After my work with the clothing brand, I started looking around at influencer networks to see which one would be the best fit for me. The network you work with will often calculate your engagement rate for you, and offer you tiers of payment based on your stats, whether that’s number of followers, engagement rate, or another metric that’s unique to their goals as a network. What are brands hoping to achieve through your participation in their marketing as a micro-influencer? In my experience, a lot of times, they’re wanting to spread the news — of a new product, or a new promotion. They often have special landing pages that they’re driving to from the different influencers, to track where traffic is coming from and how it’s performing per influencer. Also, I think it’s important to note that rarely would a brand rely solely on influencer marketing to get their message across. It’s almost always going to be one cog in a much larger machine. Micro-influencers are not the end of traditional ads: They’re a personal, authentic-feeling complement to traditional ads. What do you think is the key to giving brands the best post for their money? The first thing is having a good product, whether that’s a cool jacket or awesome lipstick or a restaurant with good food. If your stuff is cool already, I’m just amplifying it. Probably the time I generated the most sales for a company was that first clothing brand: People were like, OMG that jacket, where can I get it. With a genuinely good product or offer, you can feel the energy of the influencer as she’s writing her post. You can feel the authenticity, and it’s electric. The other way to ensure a post is as effective is it can be is to give the influencer creative license to craft the post the best way she knows how. That’s because the influencer knows her audience. She’s literally spent hours of her day cultivating conversation, encouraging response, and getting to know her followers. She knows what will work, because she’s lived in that space and learned, over time, what’s going to work best. Let me give you an example: Back in the day, I thought I had to limit the number of posts that I featured myself in, because I worried people would think I was, you know, narcissistic. But what I found, in going over the data and which posts were getting which likes, was that pictures with me in them vastly outperformed pictures without me in them. So if a brand is going to insist that I only show my hands, for example, and spotlight the product exclusively, I know that that’s going to suffer in terms of performance for my audience. Why do you think micro-influencers are such an effective marketing tactic right now? You know, it’s a cluttered landscape. People are having to do so much paid promotion on social because nothing’s working if you’re doing organic. So including a micro-influencers in your marketing plan can help keep your marketing costs down while hitting your demos and verticals. It makes sense financially. Additionally, people are tired of being advertised to. Everyone has an ad blocker now. When a commercial comes on, I mute it. We are all trying to avoid advertising. In contrast to that, you have the micro-influencer. Now, that’s not to say that people don’t know that micro-influencer posts are advertising. Everyone knows. FCC guidelines and mandatory #sp or #ad hashtags make it clear that a person is being compensated for their work, if they are. But it’s a subtle game. At the end of the say, you’re still receiving a product recommendation from a person you know and/or trust. And that carries a lot of weight, even if you know they’re being paid for it. And, if the micro-influencer is good, and has a good eye, they’re presenting a product or service in a visually appealing, personalized way. It’s interesting — it has visual entertainment value that is unique. Well Lana, I’m sure you’re very busy so I’ll just close with one final question and we’ll call it a day: Who would be your dream client? Thanks so much Lana! Best wishes on your continued influencing.